Size of this preview: 800 × 406 pixels. Deutsch: Fiktive Karte, die die politische Landschaft von Orwells 1984 zeigt. English: Fictitious map, illustrating the political landscape of Orwell's Nineteen Eighty-Four[wp]. Español: Mapa ficticio, que ilustra el panorama político de la novela 1984[wp] de Orwell. 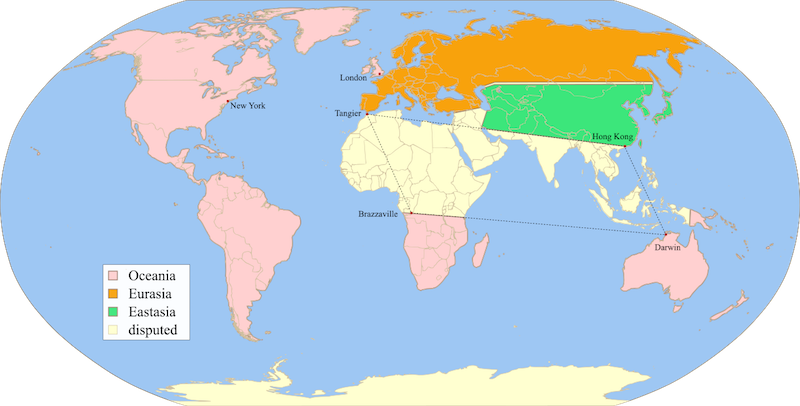 Fictitious map, illustrating the political landscape of Orwell's Nineteen Eighty-Four[wp], based on 1984 fictious world map v2 quad.png[ext], rendered from 1984 fictious world map v2.svg[ext], inspired by 1984 fictious world map.png[ext] and 1984 Orwell arrows 2.png[ext], based on File:BlankMap-World6.svg[ext], created following Wikipedia's map color standard. To embed this file in your language (if available) use the lang parameter with the appropriate language code, e.g. [[File:1984 - Fictitious world map.svg|lang=en]] for the English version.